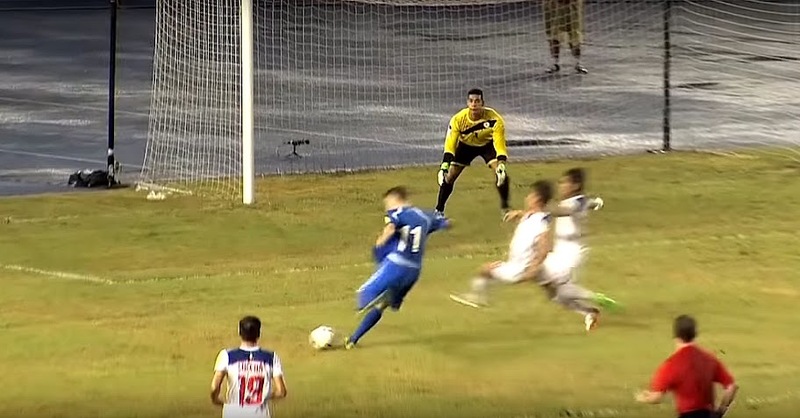 Image credit: Photo captured from video on the AFC Cup on YouTube. I never doubted for one moment even after last September’s ignominious home shellacking by the Mighty Uzbeks that the Philippine Azkals were very capable of nicking at least a point when the tie swung over 5,772 kilometres to Tashkent. Back then, at the Philippine Sports Stadium, the Azkals curiously even played well on two-thirds of the pitch; but were simply woeful at the defensive third and guilty of schoolboy errors. Last night of course at the Bunyodkor Stadium – think of it as the Philippine Stadium but with people – any optimism I still clung to evaporated ten minutes into the match. OJ Porteria, poor lad, flew into a tackle and for his troubles won an early trip to the showers from Japanese referee Ryuji Sato. The tackle looked innocuous enough at normal speed. Slowed down and closer via the replay, Porteria did plant remember-me-by stud marks on the Uzbek defender’s shin. A more lenient referee might have flashed yellow; but Sato in the context of modern interpretation was well within his rights to show straight red. Not that any malice was involved, and least of all from Porteria. Missing senior players due to either injury or suspension and with several seasoned heads recently hanging up their boots, the entire Philippine team in the opening minutes looked fired up and willing to match the host team slug for slug. But also looked a tad excitable; and not in a good way. Porteria’s dismissal and Martin Steuble’s yellow were symptomatic of this excitability; and Juani Guirado’s tackling was not for those with heart conditions to see. They do say that adversity brings out character; and on the evidence of the Uzbeks winning by a solitary goal from a dead ball at that before an expectant home crowd showed that the young Philippine team possesses plenty of it. Heroism, even; and I hasten to add that I am rarely the sort to lavish praise on football players, even those of the teams I myself coached. It is just that I am at a loss to find a more appropriate word for ten men running their socks off to keep out a rampant Uzbek team; or players hurling their bodies time and again at point blank range to block Uzbek shots. Then there was Neil Etheridge, Spiderman over two legs of that Renaissance World Cup qualifying tie against Kuwait four years ago. Over those two matches, Etheridge was such the precocious talent who seemingly had the world at his feet. Etheridge for the Azkals has blown hot and cold in the intervening years, and was culpable for at least two of the Uzbek goals at the Philippine Stadium last September. Last night in Tashkent, he had the Spiderman suit back on, making stunning reflex saves of the sort that can only be described as what else but world class. In this form, the Uzbeks needed something special to beat Etheridge. The goal, off Anzur Ismailov’s head in the 59th minute, was something no goalkeeper in the world could have stopped. The marking, perhaps, could have been tighter; but in the context of how the game has ebbed and flowed, it is difficult to either begrudge the Uzbeks a goal or find fault with any of the Filipinos. This was always going to be one of those games when a narrow loss would feel as good as a win; and especially so because of the bravado displayed by the entire Philippine team in the face of adversity. With Bahrain making the most of a home game last night against Yemen, the Philippines after being joint top in the early stages of World Cup qualification has now slipped to second from bottom. Bahrain this Tuesday, however, will be in Tashkent while the Azkals will be at the Rizal Memorial against DPR Korea. Asian Cup qualification is still very much possible for the Philippines, but a victory against the North Koreans and a loss by Bahrain will make it so much easier.